9th June, Sunday 10th, Friday 15th, Saturday 16th and Sunday 17th June 2012 I will be taking part in North Yorkshire Open Studios. I will also be open during the week 11th to 14th June by appointment. During Open Studios I will be demonstrating a variety of techniques during the day, starting at 11am – including making unique silver jewellery using art clay silver. The road from Egton to Glaisdale is going to be closed near Beggars Bridge for three weeks during the period of Open Studios. To get to Glaisdale you will have to approach via Lealholm or Rosedale. This affects anyone intending to visit – but it will be worth the trip to see my wonderful new studio, watch demos and buy something from my new ranges of work. Friday 22nd June 2012 Enamelling on silver at Artison, Masham book direct with Artison or email me if you would like to arrange to take this class in my studio. 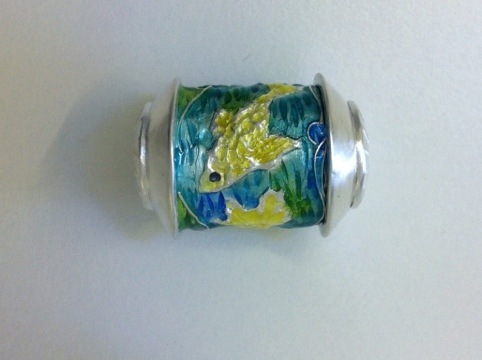 **Saturday and Sunday 7th and 8th July 2012 Special Two Day Enamelling workshop with Guest Tutor Tilly Wilkinson, teaching Images into Enamel £150 per person for the weekend course – See separate post for more information. This is the first weekend of the Guild of Enamellers Exhibition at the Pannett Art Gallery in Whitby. 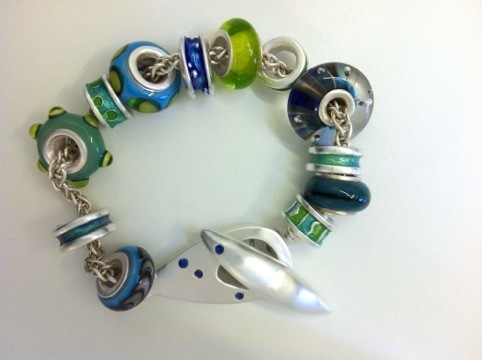 Learn how to add wire patterns to the surface of silver beads and then add enamel, firing them in the electric kiln – to make your own special focal beads. (Handmade lamp-work glass beads will be available to purchase on the day to complete your own special necklace). Saturday 28th July and Sunday 29th July 2012, a two day workshop. On the first day you will design and make silver earrings, learning the basic principles of design for plique a jour enamel and firing and finishing them ready for the second day. On day two you will learn to prepare the enamel and to apply it, firing and gradually building up the cells until they are filled. You will then give the pieces a final finish and add the findings ready to wear. The course includes small amounts of three enamel colours, enough to complete the project. Saturday 20th and Sunday 21st October 2012, a two day workshop. On the first day you will design and make a silver pendant, learning about design for enamel. On the second day you will prepare and apply wire patterns followed by thin layers of enamel, firing each layer in turn. You will then learn methods for finishing the piece to a high standard. The course includes small amounts of enamel, enough to complete the project. Thursday 8th and Friday 9th November 2012 – two day workshop. On the first day you will learn to apply a variety of art clay silver products to the surface of glass beads before firing and annealing them in the kiln. On day two you will make some art clay silver beads to complement the glass beads before finishing them all to a high standard. 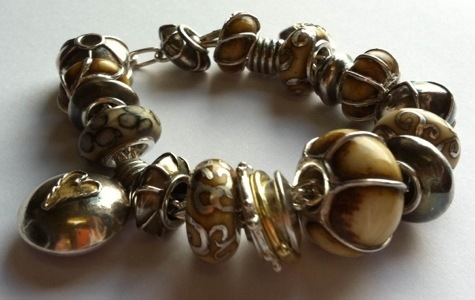 Some glass beads are included in the course fee but not the art clay silver. A detailed materials list will be supplied in advance but you will need approximately 20g Art Clay 650; 10g Syringe type, Art Clay Silver Overlay paste – limited places available, email me to book or for further information. 7 days notice of cancellation of a booking is required so that we can resell the workshop place. Each class has a maximum number of places available and a minimum number before it can run. If we have to cancel a workshop we will give as much notice as possible and a place will be offered for an alternative workshop at a future date. Refunds will be given in the event of tutor illness or insufficient numbers booked for a workshop. We reserve the rights to vary these terms and conditions at any time.